The intuitive touch display together with the optional HyPAS apps take many time-consuming tasks off your hands, ensuring complex workflows become simple processes. Do you perform a lot of your work on a smartphone or tablet? If so, you can use our free Mobile Print App or Apple AirPrint to send print jobs directly to the system. 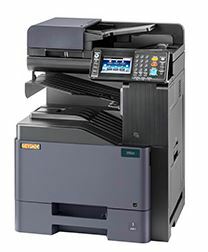 In its standard configuration the 300ci comes equipped with a document feeder for 75 sheets, a duplex unit and a paper supply of 600 sheets. Do you want more? You get it! For example a staple finisher or multi-tray with various individual mailbox bins, additional paper supply, a fax system, a hard disk and a data security kit – and much more!